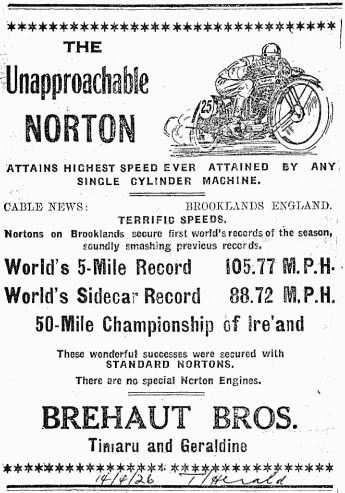 -SG- John has been in touch, following the recent posting of NZ Norton adverts sent in by Peter Thomson, and has kindly sent in a scan of a later advert from the Timaru Herald. The date written on the bottom of the ad. 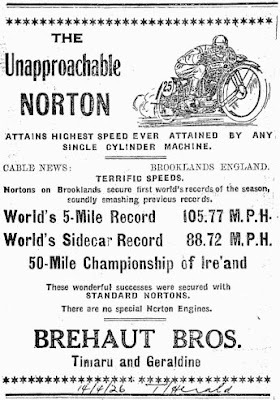 appears to be a year out, however, as Bert Denly - plus Nigel Spring prepared 588 Norton - took both records in early April 1927. I have not checked the copies of Motor Cycle/Cycling for period reports but the late Peter Hartley's book 'Brooklands Bikes in the Twenties' says that both records were achieved with the same machine and that several other records were taken in both rides.